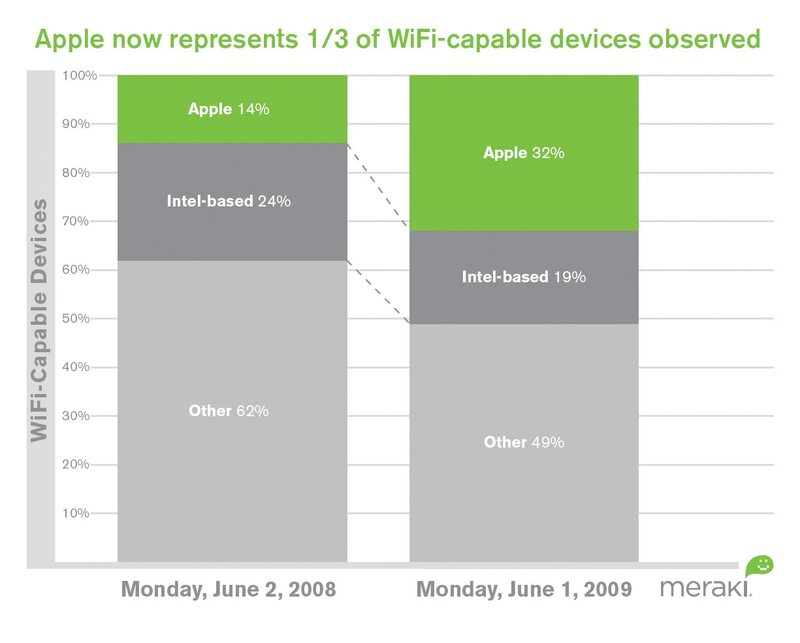 Meraki released its first-ever Meraki Wireless Census on August 18, 2009. The results reveal bold increases in the number of wireless-capable devices in use in North America, and even larger increases in the number of Apple devices and handhelds being used. We believe the data say a lot. The growth in devices overall is impressive, but the growth for Apple, Nokia and RIM devices is stunning. The data paint a vivid picture about how people access the Internet, and the trends we can expect for years to come. The census compared activity seen by a single set of randomly selected Meraki wireless access points in North America in 2008 and 2009 in order to understand macro-level traffic and end-user device trends. 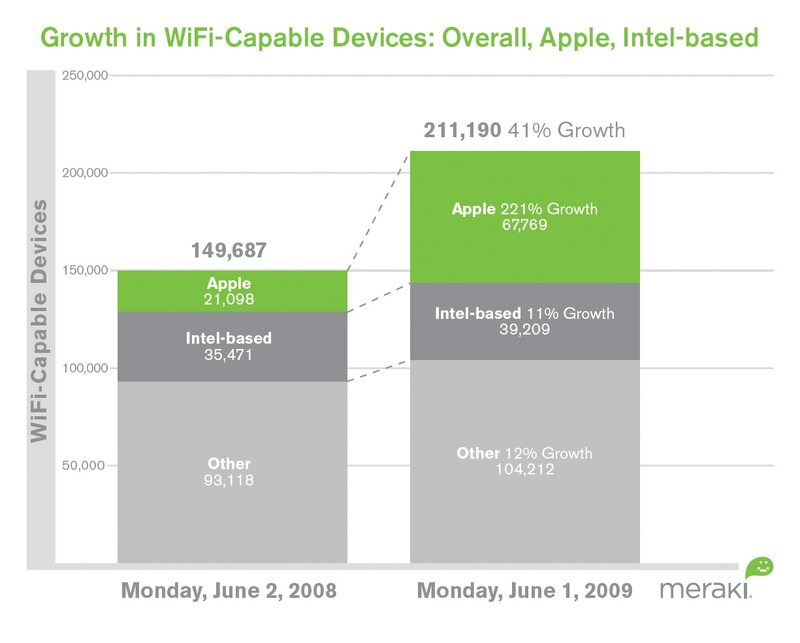 The number of WiFi compatible handheld devices also grew significantly. The number of Research In Motion (RIM) devices observed in North America grew by 419% from 2008 to 2009, and Nokia devices grew by 114%. 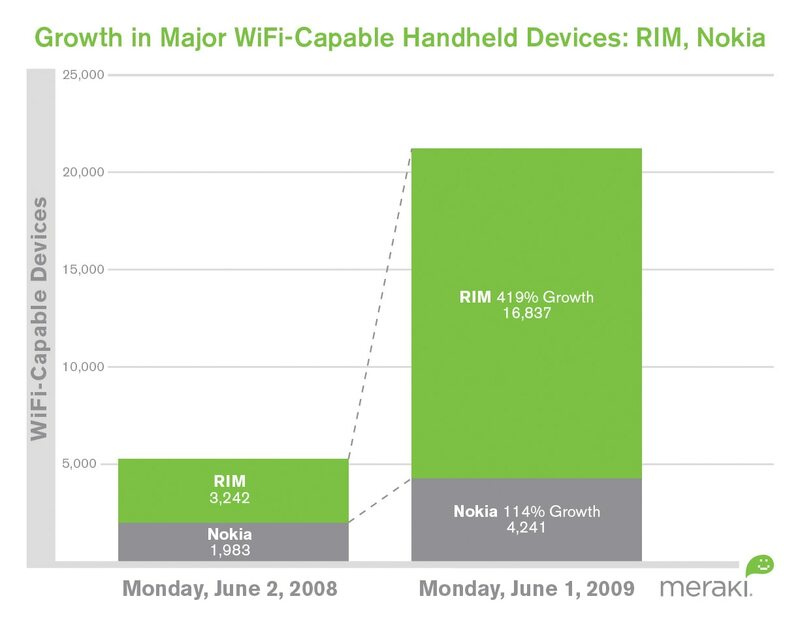 In 2008, RIM devices represented just 2% of all devices observed, but grew dramatically to 8% for 2009. In 2008 and 2009, Nokia represented 1% and 2% of all devices, respectively. The Meraki Wireless Census surveyed 10,000 randomly selected Meraki access points in deployment in North America for two 24-hour periods: June 2, 2008 and June 1, 2009. The study measured the number of distinct client devices that sent probe requests in each 24-hour period. The purpose was to identify wireless trends between 2008 and 2009. Keep an eye out for additional census studies in the months to come.